Man, your work bench looks like mine! Giant jet and all. Muhahahaha Have you found all your references for vents and such? It can be tough. 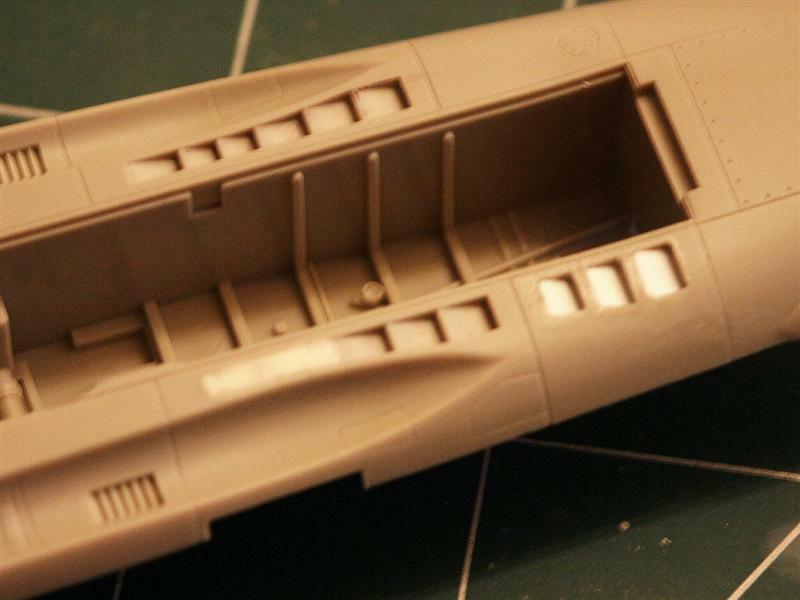 All I have been doing on the thud is work on the vents and a little stressed skin. Those intakes came out great! Ahhhhh, young Master Matt...gloat whilst you can! Just started a 9-day vacation, so I'm probably going to be giving hourly updates on this here build. heh heh. I would know knaught of any 'stressed skin' effect on this model. Why? Cause F-4S's were re-furbished and had these here 'straps' for strengthening. No sagging, soggy, wrinkly skin on this beaut. Spent about 30 minutes on my back under some F-4S's on the Midway's flightdeck today, checking out exactly what's going on under there. (everybody probably thought I was a wino sleeping it off ) Had to refine the shape of my reinforcing straps a bit. 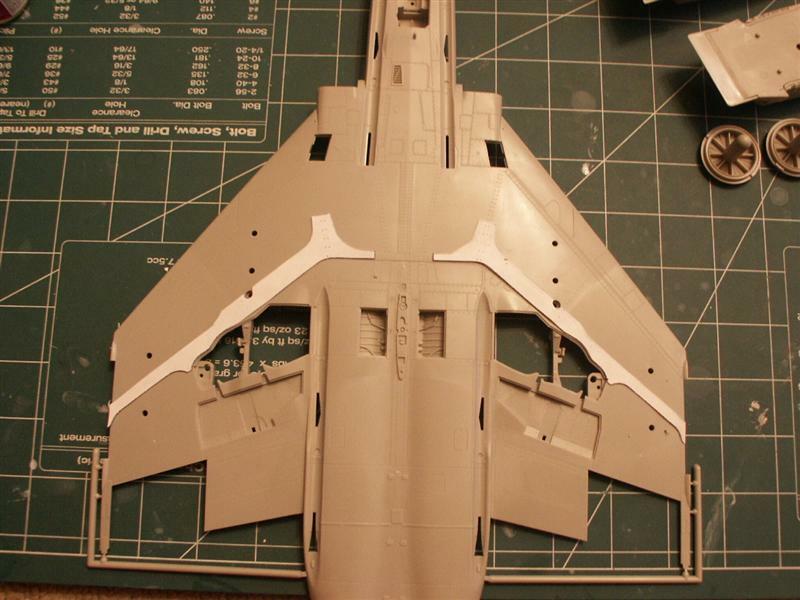 Also got a look-see to confirm my avionics vents are indeed staggered and correct. Whoohoo! Gahhh, Don't usually get up before one o'clock in the afternoon,(true artiste' never get up before noon,eh? ) so it's time for me to take a nap. Fiddled around with my new staggered avionics exhaust outlets and got em knocked out. Also got my straps applied. Thinnest styrene I could find, so glueing it on without melting something was a rear-end puckering experience. Ready for a rivet job when I get up. Here's some pics of the new location for the 'reverse scoops', and started to putty in the now superfluous rear exits. Mind numbing job of putting in the 'reverse' on the scoops is now done. Darn things is small!! Strengthening 'straps' are installed, and ready for my pseudo rivet job. Taking a hard look at all the aerials and lights, and such to make sure this bottom piece is now done. 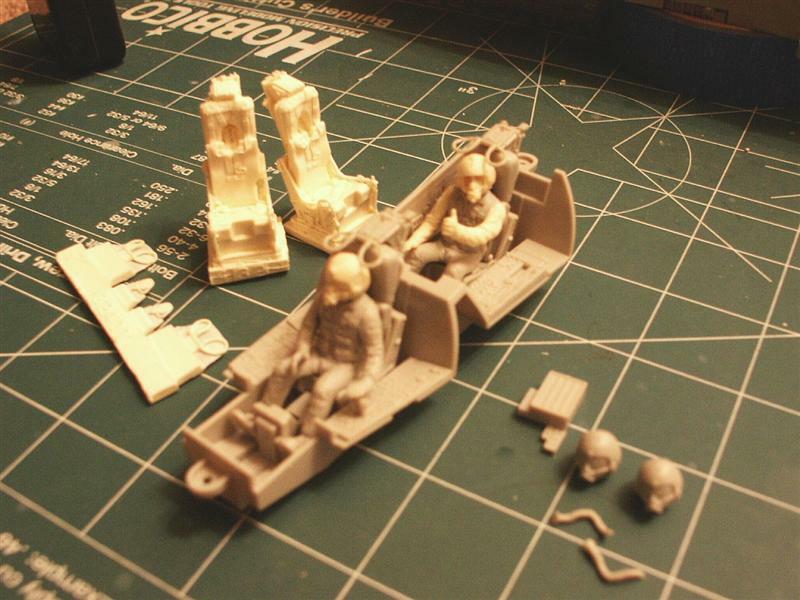 Hmmm, think I'll move onto the cockpit, and painting my pilots up next. Ahhh yes, a nap and got my laundry done. Get the essentials done first during vacation. Piddled around with the cockpit for awhile, and got my pilots 'personalities' down to something I like. Pilot with visor down looking off to the right, busy with getting where he's going, and the RIO in back with nothing to do giving the ole 'GO NAVY' thumbs up to an errant photographer with his visor retracted. Hmmm, acceptable. True Details seats are gorgeous, but won't be used. If I didn't have pilots, I would for sure do this, as they have all the harness detail and such. Just can't see too much of them when buttoned up, oh well. Save them and the resin AF wheels I got for an Aussie F-4E build in the future. Didn't even use the MasterDetails pilots, except for a few heads and arms. Wanted to make sure nobody is going to bonk their noggin on the canopy, and had enough room for Mr. 'Thumbs Up'. Also lets me sure my heads are tilted naturally. This is their 'we're taxiing by,... going for a joy-ride (ehrm, training mission) pose. Can I please ask what method/material you did use to glue the strenghtening strap that neat? Heeeey, Loic!, Glad you could pop in and see what's going on. I enlarged the Tamiya parts diagram on the directions, cause they're an exact match for all the panel lines/outlines, ect. Must have been done in CAD. Drew the 'reinforcing strap' on the plans and cut them out. Sprayed some water based adhesive on the paper and stuck em on some VERY thin styrene sheets. (just like I did with the pancake paper airplane plans) Then cut those out, peeled the paper off, and carefully applied glue with a small paintbrush to not melt the styrene. They don't look like they're cut very straight in the pics above, cause when I re-sized to post it caused distortion. 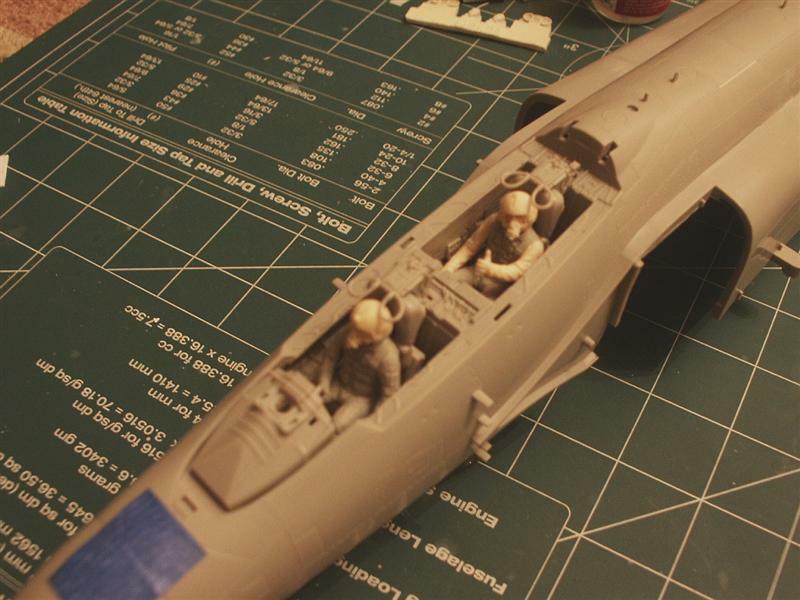 Sheesh I was nervous, that thin styrene sure does melt easy and I didn't want to do this twice. Whew! Well, I never drink coffee...but I had to break in my new mug. Sooo, now I'm bouncing off the walls and messing up bad. Got to thinking. (dooooh) If I've got pilots in this, and it's taxiing around.....why are my after-burners fully open? Hmmmm. Wanted to add a unique touch to this build, and I can't say as I've ever seen one of these with the AB tulips fully closed. 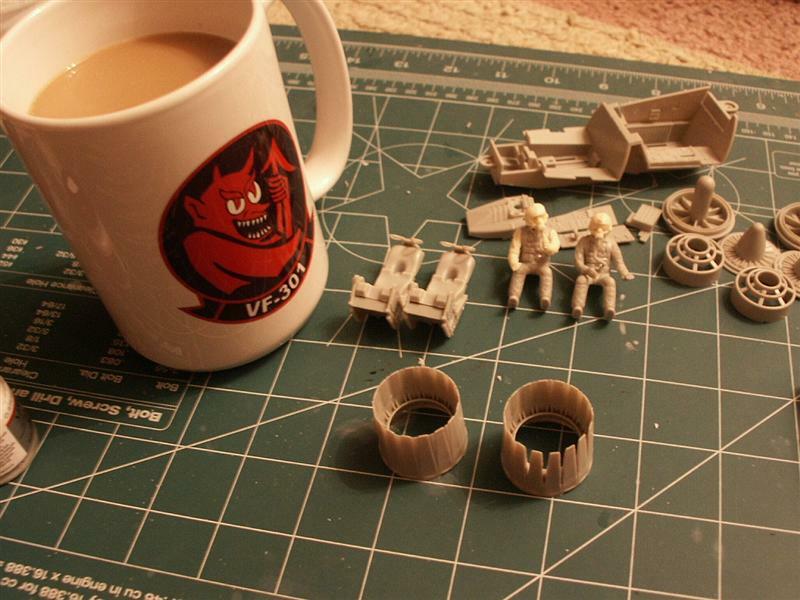 I might have replacement resin exhaust nozzles in my immediate future, as I've started cutting the kit parts up. Must see if I can do this. Anybody else ever seen this done? Gahhh, the evils of drinking 'bean juice'! 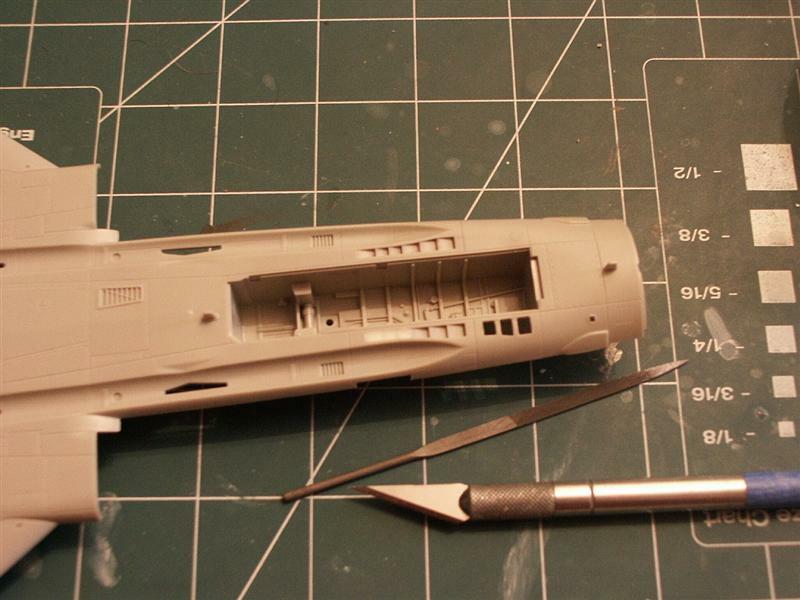 16 cuts on the nozzle, 16 razor cuts on the inner actuating ring for each engine. I need more coffee. "If I've got pilots in this, and it's taxiing around.....why are my after-burners fully open?" Hey dude! You would not have this kind of problem with props HaHaHa! Wanted to thank everybody for their interest in this continuing dirge. Also wanted to apologize for using the term 'pilots' in my cockpit shots. These are 'AVIATORS' in naval parlance. I humbly stand corrected. Loic;- So true, but I get to avoid my 'nemisis',...the dreaded exhaust stains...by doing jets. 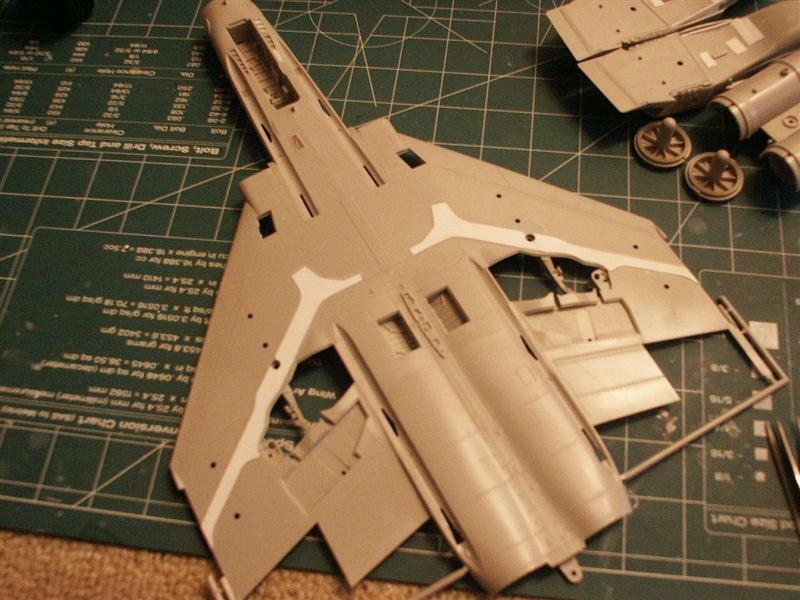 That will haunt me at the end of this build though, as the Phantom has pretty sooty tail-feathers! Matt;- You must be psychotic,...oh ehrm, I mean psychic(my spelling, tsk.)! I was contemplating doing something very much along those lines. A little reversed from your vision though. Was going to drill/lengthen the gear at full extension, have everything drooped 'down & dirty' and having it mounted 3-point at the moment of impact,...uhhh, I mean landing...with the tail-hook grabbing a wire and the mains just kissing the deck in a nose-high attitude. Kinda why I needed to have the nozzles closed,... wouldn't want my AVIATOR landing with full burners going! (hmm, maybe that's why the RIO has that "cuckoo for cocoa-puffs" wild eyed look?) Because of the putty now in my seamless intakes, I don't know if the model is now structurally capable of being posed like this. Lot more weight up front now. Hmmmmm. Derek;-Great tip on the Future for adhereing stuff. Never tried it for that. 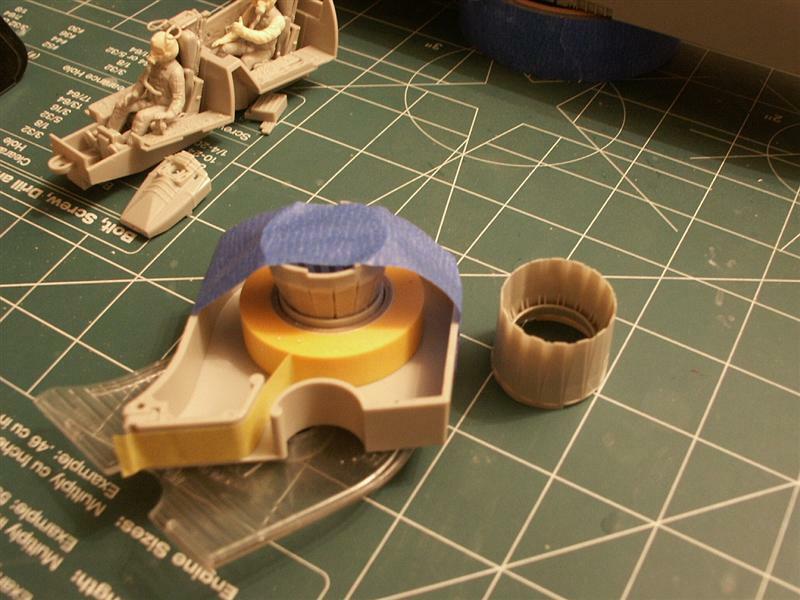 I'm going to put my nano-goggles on and try and detail the inner nozzles in my best interpretation of your cowl-flaps. Gotta make another trip to the Midway and stick my head up 'the can' and see what's going on in there. Enough quibbling and yakking, on with the show. After cutting between all the feathers on the can, and slicing a cut on the inner ring of the actuating mechanism in 16 places(there are 16 feathers),..I was able to get everything to 'compress' into a closed nozzle. Okay, I had to use needle nose pliers for persuasion and get the bends in exactly the right place. Nothing like a little 'heavy artillery'! Plastic is thick in this area, and I needed something to compress the nozzle down and hold it into the correct circular shape while rebuilding the insides. It kept wanting to revert back to its 'open position'. First thing handy happened to be the spindle of a dispenser of Tamiya tape. This is under a lot of pressure to keep it stuffed in there, but keeps everything circular at the exhaust. Using this dispenser was my 2nd mistake. First was actually trying this. Maybe a cable tie??? Might not keep it as round as your current setup though.